Gift baskets Includes gift card. Fill it out at check out in the "Extra Customer Data" section. Gift baskets ship 3 day priority mail and only within continental United States. In the United States, Mother's Day is an annual holiday celebrated on the second Sunday in May. Mother's Day is the celebration of mothers, motherhood, maternal bonds and pretty much all things Mom. 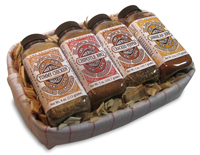 If your Mom likes to cook, or bbq and grill, we have the perfect gift for her, our dry rubs and specialty seasonings gift baskets. 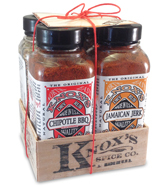 Knox's Spice Company has created dry rub gift baskets for the mothers who love to cook, bbq and grill. When most moms are weeding through chocolates and smelling flowers yours will be in the yard firing up the grill. She may even be using the basket to light the coals, after she removes the dry rub seasonings of course. These bbq gift baskets, with our gourmet dry rub seasonings, are special gifts that keeps giving. Different from traditional baskets that are full of snacks or sample sized "gourmet" products, our basket is for the Mom that knows her way around a grill or BBQ pit. 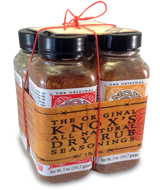 Knox's all-natural dry rubs provide all the flavor. 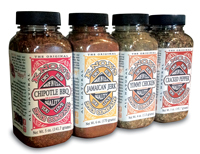 Your mother can apply it to bbq food she loves; ribs, brisket, chicken, whatever she likes. 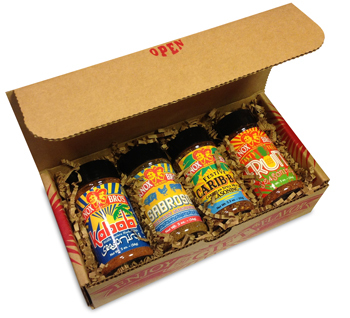 Your bbq gift basket of flavor will not soon be forgotten. Combine all that flavor with a couple pounds of beef, chicken or pork, and you will have created fond memories of some truly excellent eating. You may even be invited to enjoy it with her and get a really nice meal out of it or make it for her. Possibly a couple Cracked Pepper Sirloin or maybe even Chipotle BBQ ribs or brisket. It is Mother's Day, treat her. Gourmet seasonings. Gift basket for Grill Master Mom. Mother's Day dates back to the era of ancient Greek and Romans. The official celebration of Mothers day in US was first suggested by Julia Ward Howe in 1872. Julia Ward was an activist, writer and poet. She rose to fame with her famous Civil War song, "Battle Hymn of the Republic", you have probably heard it. The first Mother's Day was suggested to be on June 2 and be dedicated to peace. Ms. Howe wrote a passionate appeal to women and urged them to rise against war in her famous Mothers Day Proclamation, written in Boston in 1870. Julia tirelessly championed the cause of an official celebration of Mothers Day and declaration of official holiday to be observed on June 2nd. Her idea spread but was later replaced by the Mothers' Day holiday now celebrated in May. She did not get the day she wanted, but she got the holiday, and we are happy about it. If you know your Mom, and hopefully you do, you probably know she may not ask for much from her children. An attitude only a Mom can have. You understand if you have children. Most Mom's are happy if you are safe, clean, fed, smart and polite, not necessarily in that order. To buy the perfect gift for Mom you need to know what she likes and this may not be easy. Most Moms might enjoy something and not really share the joy. Does your Mom enjoy cooking or enjoy food in general? Is she a foodie? Does she enjoy preparing meals, even by herself? If so you may have already found her gift, above. Does she golf or go fishing. Is she an avid reader or enjoy travel. If you know what Mom enjoys than you surely will find a unique gift that she will not buy for herself. If Mom complains, listen. Maybe she does not complain much so you will have to pay extra attention. Does she work in the yard or have a garden? Maybe a mud scraper for her boots or a gardener's stool. Does Mom like to cook or grill and bbq? Maybe a dual digital thermometer or a Chef's Knife. A sharpener is a big hit as Mom's who keep a nice kitchen love tools and a tool that makes her other tools better or last longer is a good thing. Mom's like useful gifts and if you can find a useful gift that involves relaxing you will certainly get a gold star for the day. Does Mom enjoy some down time? You may not know as you may not ever see Mom with down time. The best gift is to find out what her chores are and take care of them for her or maybe a service like window cleaning, carpet cleaning or gutter cleaning. Do not under-estimate the power of taking care of a chore for your Mom, just make sure it is not something they enjoy doing. Gifts that make Moms life simple or easier are always good even if they seem like simple gifts.